Yipee! Congratulations Sarah!! We are really excited about your new family member! Get this cradle out of my office! I am glad you are feeling great! Congratulations. The tiredness will pass in a few weeks...it kind of comes back at the end, but I always thought the first trimester was the worst energy-wise! You will be adorable with a baby bump!! Avery might still sleep in your bed, but you will be shocked at the small changes...Tank is just now getting good attention again--poor guy--his life changed. Now he gets plenty of attention including some unwanted attention from Lilly. Haha. I will be tuning in for updates!! Congratulations, Sarah! I am so happy for you... belly pics, please! As much as I love the Avery updates... I have to admit... I'm excited about the baby updates! So great!! 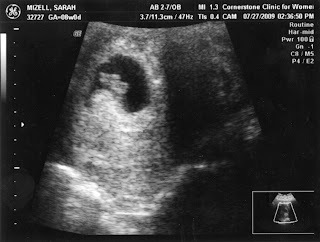 This might be a silly question, but do you have to have a scanner to put the ultrasound pics on your blog... just curious? So nice that you aren't having morning sickness... it is the pits! So happy for you! Congratulations! This is so exciting...It'll all work out just perfectly! congrats you guys! that is so exciting!!!!!! !